The Global Volcanism Program has no activity reports for Mono Lake Volcanic Field. The Global Volcanism Program has no Weekly Reports available for Mono Lake Volcanic Field. The Global Volcanism Program has no Bulletin Reports available for Mono Lake Volcanic Field. The Mono Lake volcanic field east of Yosemite National Park and north of the Mono Craters consists of vents within Mono Lake and on its north shore. 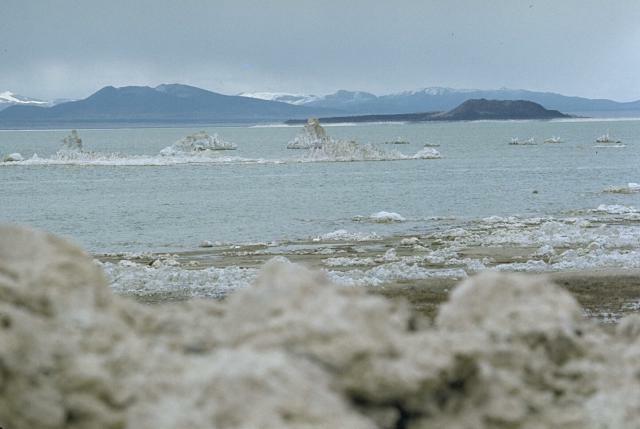 The most topographically prominent feature, Black Point, is an initially sublacustral basaltic cone that rises above the NW shore and was formed about 13,300 years ago when Mono Lake was higher. Holocene rhyodacitic lava domes and flows form Negit and parts of Paoha islands off the northern shore and center of the lake, respectively. The most recent eruptive activity in the Long Valley to Mono Lake region took place 100-230 years ago, when lake-bottom sediments forming much of Paoha Island were uplifted by intrusion of a rhyolitic cryptodome (Stine, in Bailey et al. 1989). Spectacular tufa towers line the shores of Mono Lake. Bailey R A, Miller C D, Sieh K, 1989. Excursion 13B: Long Valley caldera and Mono-Inyo Craters volcanic chain. New Mexico Bur Mines Min Resour Mem, 47: 227-254. Bursik M, Sieh K, 1989. Range front faulting and volcanism in the Mono Basin, eastern California. J. Geophys. Res, 94: 15, 585-15,609. Kilbourne R T, Chesterman C W, Wood S H, 1980. Recent volcanism in the Mono Basin-Long Valley Region of Mono County, California. Calif Div Mines Geol Spec Rpt, 150: 7-22.
b) Zoomed view of Paoha Island: the InSAR mean deformation velocity map (with indicated the location of the pixel labeled as PI), superimposed to an orthophoto of the area, and the lithologic map of the island (data modified from Bailey (1989)) are shown on the left and on the right hand side of the figure, respectively. From: Tizzani et al. 2007. Reference List: Tizzani et al. 2007. 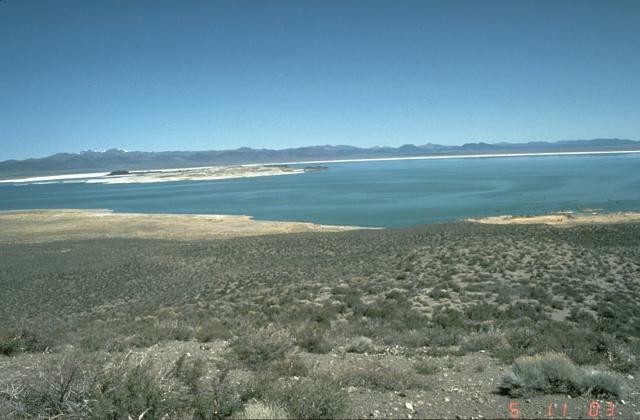 There is no Emissions History data available for Mono Lake Volcanic Field. Negit Island, capped by the dark-colored cinder cone at the right, was the source of one of the most recent eruptions of the Mono Lake volcanic field. Rhyodacitic lava flows overlie a 1240 CE tephra unit. 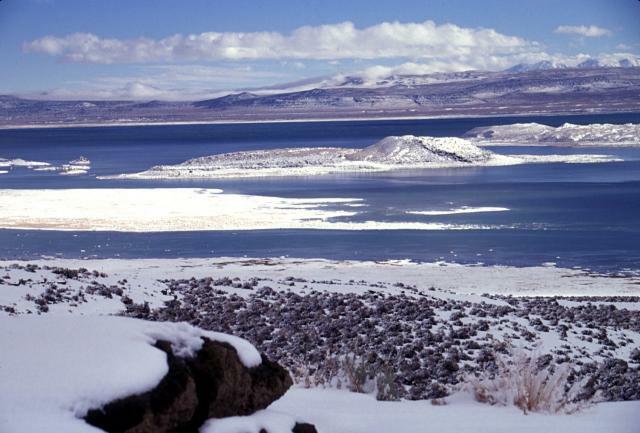 The light-colored tufa deposits near the western shore of Mono Lake in the foreground were created by deposition of calcium carbonate beneath the waters of the lake. Photo by Lee Siebert, 1973 (Smithsonian Institution). Paoha Island in the center of Mono Lake at the left is seen from the flanks of Panum Crater on the south, at the northern end of the Mono Craters. The Mono Lake volcanic field consists of multiple volcanic vents on the northern shore of the lake and on Paoha and Negit Islands, which were last active a few hundred years ago. The Mono Lake volcanic field consists of rhyolitic lava domes and flows, phreatic explosion craters, and cinder cones on islands in Mono Lake and on its northern shore. This view shows explosion craters on Paoha Island, with the Mono Craters dome complex and the Sierra Nevada in the distance to the south. The ages of the most recent eruptions of the Mono Lake volcanic field range from about 2000 to about 200 years. Negit (right-center) and Paoha (far right) islands in Mono Lake are seen from Black Point, a basaltic cone on the NW shore of the lake. 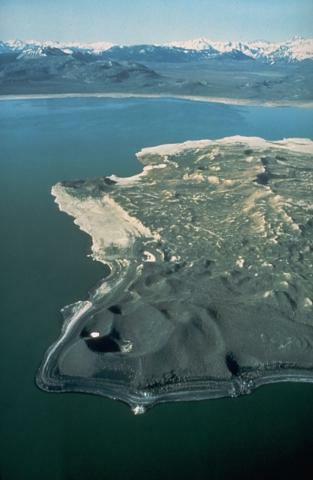 The most recent eruptive activity from the Mono Lakes volcanic field took place 100-230 years ago, when lake-bottom sediments forming much of Paoha Island were uplifted by intrusion of a rhyolitic cryptodome. Black Point is an initially sublacustral cone that formed about 13,300 years ago when the lake was higher. The White Mountains form the far right horizon. There are no samples for Mono Lake Volcanic Field in the Smithsonian's NMNH Department of Mineral Sciences Rock and Ore collection. Large Eruptions of Mono Lake Volcanic Field Information about large Quaternary eruptions (VEI >= 4) is cataloged in the Large Magnitude Explosive Volcanic Eruptions (LaMEVE) database of the Volcano Global Risk Identification and Analysis Project (VOGRIPA).